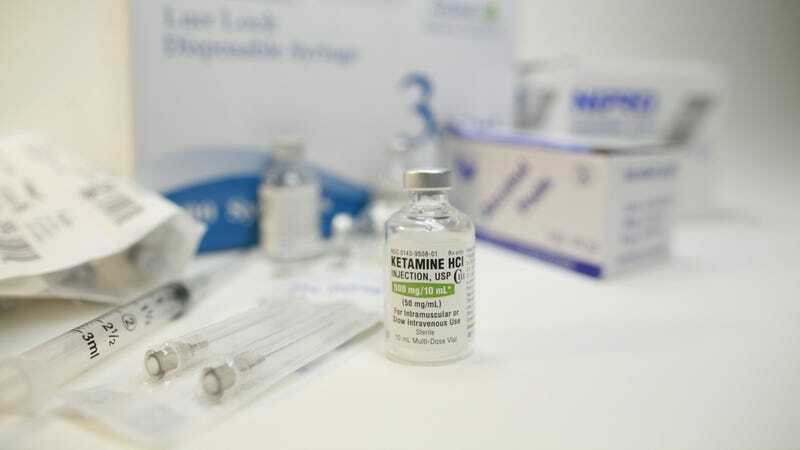 In recent years, the party drug and anesthetic ketamine has been embraced as a rapidly-acting, if still off-label, medication for some cases of depression and suicidal ideation that don’t respond to other treatments. But there’s still much we don’t understand about how it actually works so quickly to treat the crippling disorder. A new study released Wednesday out of Stanford University suggests that at least some of ketamine’s mojo relies on the same brain receptors that opioid painkillers activate. The researchers started with 12 volunteers who had treatment-resistant depression, and gave them ketamine infusions. Some volunteers, however, were randomly given an additional dose of naltrexone—an opioid that can block and reverse the effects of opioids—while others were only given an extra shot of a saline solution. Mirroring other ketamine studies, many volunteers in the saline placebo group quickly experienced relief from their depression, with more than half reporting at least a 90 percent reduction in their symptoms in the first three days post-infusion. But there was no improvement in those who had gotten naltrexone at the same time. The results were so dramatic that the researchers decided to cut the trial short, rather than force more people to possibly get an useless treatment (originally, they planned to dose 30 volunteers in total). Interestingly, the authors noted, people who took ketamine with the opioid blocker still experienced dysphoric feelings as much as the placebo group did. That suggests it’s not the trippy, out-of-body experience some ketamine users report having that’s accounting for the quick boost in mood either. This isn’t the first study to show that the opioid system is involved in how ketamine affects the body, particularly when it’s used as an anesthetic. But the findings, if they hold up, could have a substantial impact on the future of depression research. Researchers have been excited about ketamine’s potential because it doesn’t alter our brain chemistry the way other established antidepressants do. Because ketamine is known to block the brain’s receptors for glutamate, an important neurotransmitter that helps us learn and form memories, scientists theorized this activity might be key to its antidepressant qualities. And research has sought to create or discover other antidepressants that narrowly do the same. But these attempts haven’t seen much success in mimicking ketamine’s fast-acting effects. “There’s lots of money that’s been poured into developing other [glutamate blockers], but this might not be the right approach to creating ketamine-like drugs,” lead author Nolan Williams of Stanford’s Neurosciences Institute added. Glutamate could still be a key piece of the puzzle for treating depression in some people, but if ketamine-like drugs require opioid receptors to work, that comes with its own risks. At the same time, better understanding the complex nature of ketamine and opioids can only help us create new depression treatments. That might involve developing drugs that work on different receptors at once like ketamine, as well as drugs that can safely activate opioid receptors without triggering addiction. Likewise, opioids like morphine have been shown to have an antidepressive effect in the short term, but seem to worsen or raise the risk of depression the longer they’re taken. So finding a way to short-circuit that pattern could help pain patients. And because ketamine has also shown promise for other conditions, such as obsessive compulsive disorder, Williams said, it’s worth exploring if opioids play a role in treatment there as well.